The Commission carried out an electoral review of Newark & Sherwood between February 2013 - July 2014. The aim of the review was to deliver electoral equality for voters in local elections and recommend ward boundaries that means each councillor represented approximately the same number of electors. Our review aimed to ensure that each Newark & Sherwood councillor represented roughly the same number of voters and that ward boundaries reflected the interests and identities of local communities. The Newark and Sherwood (Electoral Changes) Order 2014, to implement recommendations made by the Local Government Boundary Commission for England (LGBCE) for new boundaries in Newark and Sherwood, was made on 15 July 2014 and was published 22 July 2014. New ward arrangements for Newark and Sherwood have now successfully completed a 40 day period of Parliamentary scrutiny and will come into force at the local elections in 2015. On 5 June 2014 the Newark and Sherwood (Electoral Changes) Order 2014 was laid in draft in Parliament. The draft order if made would give effect to the final recommendations that were consulted on during the Local Government Boundary Commission for England’s review of electoral arrangements in Newark and Sherwood and published on 25 March 2014. The draft order will be laid in Parliament for a period of 40 sitting days. Parliament can either accept or reject our recommendations. If accepted, the new electoral arrangements will come into force at the next scheduled elections for Newark and Sherwood in 2015. On 25 March 2014 we published final recommendations for future electoral arrangements in Newark and Sherwood District Council. The report is available in the link below. We have now completed our electoral review of Newark and Sherwood Council. The changes we have proposed must be approved by parliament. A draft Order - the legal document which brings into force our recommendations will be laid before parliament. The draft Order will provide for new electoral arrangements for the council to be implemented at the local elections in 2015. On 15 October 2013 we published our draft recommendations for the further electoral review (FER) of Newark and Sherwood District Council. Between 15 October 2013 and 6 January 2014 we invited comments on our draft recommendations. We received 43 submissions from local residents. All submissions are contained in one document. At the front of the document is a list of names with links to the relevant submissions. We received 27 submissions from parish and town councils. All submissions are contained in one document. At the front of the document is a list of names with links to the relevant submissions. We received 12 submissions from district Councillors. All submissions are contained in one document. At the front of the document is a list of names with links to the relevant submissions. 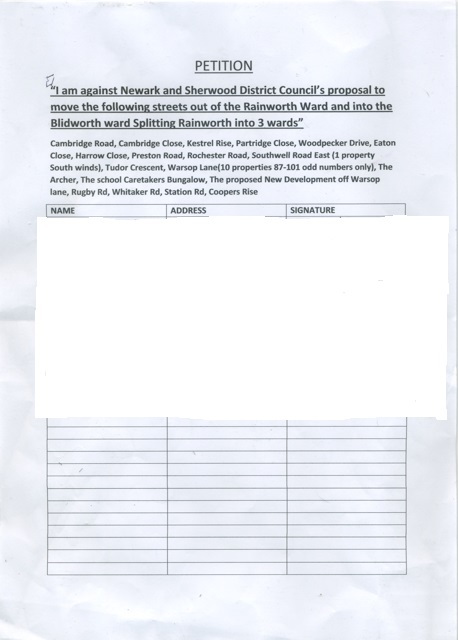 We received 186 signatures regarding Rainworth. An example can be seen below. You may find the electoral figures (XLS) useful when thinking about draft recommendations. The council have supported these updated projections with this methodology (PDF). The previous electoral figures (XLS) from the council can be found here. On 28 May 2013, we started the first period of consultation for a pattern of wards for Newark & Sherwood District Council. Between 28 May 2013 and 5 August 2013, we invited comments on the ward boundaries for the authority. We received 13 submissions from local residents. All submissions are contained in one document. At the front of the document there is a list of names with links to the relevant submissions. We received 18 submissions from parish and town councils. All submissions are contained in one document. At the front of the document there is a list of names with links to the relevant submissions. We also received a submission from Halam Parish Council (PDF). You may find the electoral figures (XLS) useful when thinking about warding arrangements. The Council have supported these updated projections with this methodology. The previous electoral figures (XLS) from the council can be found here. On 26 February 2013 we started an electoral review of Newark & Sherwood District Council. From 26 February 2013 to 8 April 2013 we are inviting proposals on the number of councillors who should represent Newark & Sherwood in the future. The first stage of an electoral review is to determine the number of councillors who should represent the local authority in the future. We call this stage "council size". During the preliminary stage of the review, the Commission received proposals from the council which are available below under preliminary council size consultation. The Commission has considered this submission and is now seeking views on its proposal for a council size of 38 members for Newark & Sherwood. As part of the preliminary process we consulted with Newark & Sherwood District Council on the most appropriate council size. We received a single submission from the council. The Boundary Committee for England began a further electoral review (FER) of Newark and Sherwood on 17 May 2005. It completed this review on 11 July 2006. On 23 November 2006 the Electoral Commission decided to accept the recommendations of the Boundary Committee for England without modifications. On 25 January 2007 the Commission made the District of Newark and Sherwood (Electoral Changes) Order 2007 to implement their decision. Web and print versions of the Order are available at the Office of Public Sector Information's website, as are web and print versions of a subsequent amendment Order. The Order describes most of the new district wards in its Schedule and refers to a map, which was re-issued by the amendment Order, comprising Sheet 1, Sheet 2, Sheet 3 and Sheet 4, of the other new district wards and the new parish wards. Mapping of the new district wards was available on Ordnance Survey's election maps website just before the elections in May 2007 that brought the new wards into force. Final report (PDF) and executive summary (PDF) published 11 July 2006. Large map sheet 1 illustrates in outline form the proposed wards for Newark & Sherwood district, including constituent parishes. Large map sheet 2 illustrates the proposed boundaries in Newark town. Large map sheet 3 illustrates the proposed boundaries in Southwell town. Draft report (PDF) and executive summary (PDF) published 6 December 2005.